This is a dessert that can be made relatively easy and would be a good accompaniment to an equally easy dinner. Our dinner tonight is chicken nuggets (chopped up), shredded cheese (served from the bag), cut up grape tomatoes, sour cream (served from the container), an open can of sliced black olives, and flour tortillas. If I’m feeling fancy, maybe a bell pepper cut into slices for additional texture and veggies. But I’m sure you don’t care…your here for the dessert recipe from 1978. So, let’s just jump into it. MODIFICATION (minor): I used fresh pineapple…because I had it. Waste not want not right?. Pineapple NOTE: Please notice that the recipe calls for a No 2 can of crushed pineapple (WHAT is that?) I had to look it up—it’s a 20 oz can or 2.5 cups…those who are seasoned cooks might know that, but I didn’t. I did it the lazy way. 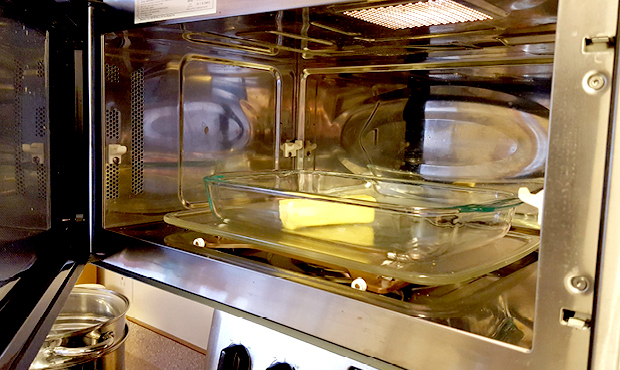 I placed a stick of butter margarine into my 9×13 baking dish and put it into the microwave to melt. I haven’t used margarine in YEARS, I use butter for everything. But I purchased it for this recipe so as to roll 70’s style. Melting the butter in the final baking dish is complete laziness and I’m OK with that! While that was happening, I started crunching up the graham crackers. And because I’m still lazy, I left the graham crackers in the package and crushed them that way. Why dirty up a food processor or wasting a plastic bag? Crushing the graham crackers while they are still in the package just makes environmental sense, no extra cleaning, no additional waste. It’s a win win. 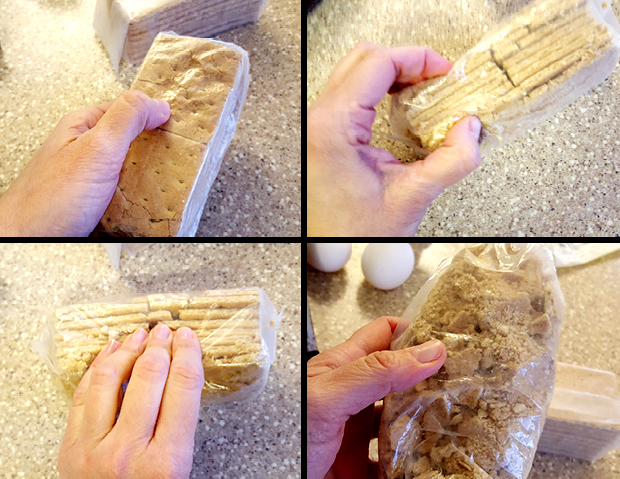 Simply use your fingers to press the top and bottom crackers in the package. Then just keep using your fingers to squeeze the package. It only took me about 3 minutes per package and I did it while standing in the kitchen and watching Marvel Runaways (this will appear on my next favorites list). 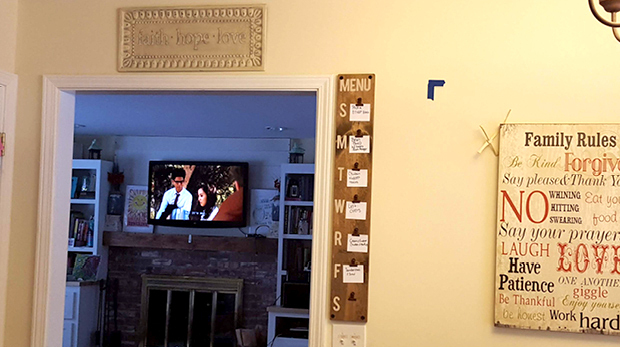 The view of my TV from the kitchen counter. I’m watching Marvel Runaways…you should be watching it too! 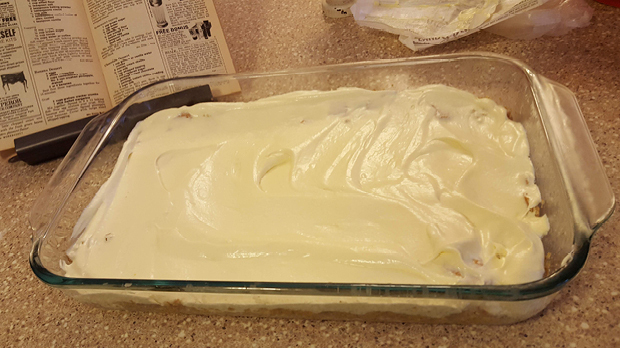 Then just pour the crackers into the 9×13 baking dish of melted margarine. Mix together with a fork and flatten to form the crust. Boom DONE and I only dirtied a fork. 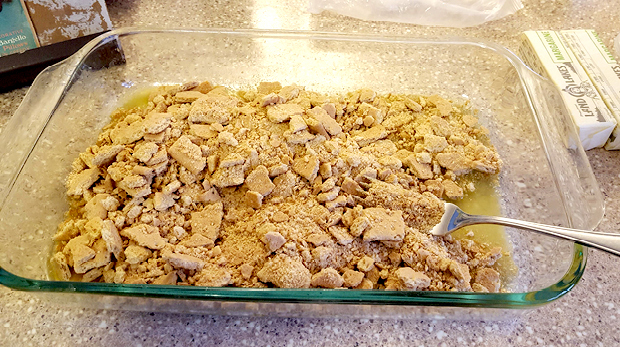 Mixing/making the crust in the final baking dish is OK—says the lazy girl who did it that way. Before I start the mousse, let me tell you something. When I first saw this recipe, I was WAY freaked out and thought that something in the recipe ‘how to’ was missing. 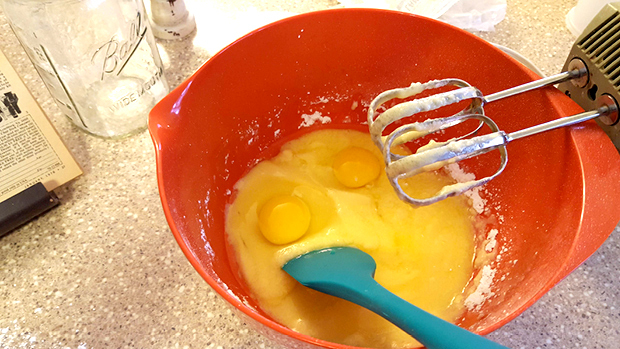 There are EGGS in this recipe and you don’t bake or cook it! WHAT? This set me back a couple steps, but then I did what everyone does when they are feeling uneasy about something…I consulted Google. Raw eggs…is this safe, am I going to get sick, can I feed it to my kids? I found that most mousse recipes (along with things like mayo-duh, Caecar salad dressing-double duh, etc…) have uncooked egg in them. Some of the info I found can be seen here 1 resource and 2. Now, in the original recipe, she calls this ‘the egg mixture’. And yes, that is what it is, but in the interest of soothing my soul (and maybe yours), I am calling it a mousse. I started by whipping my butter margarine and powdered sugar together. This was in hopes of keeping the powdered sugar mess to a minimum. Mousse layer, before eggs added (no color change) and before whipped into submission which completely changed the color. Then I washed the outside of my fresh eggs as a precaution against salmonella. Then I added them to the powdered sugar/margarine mixture. Hello yolk eyes…you’re kinda weird. Please stop staring at me. Fine, I’ll just beat you up and that’ll make you stop looking at me! I whipped this together for 15 minutes. 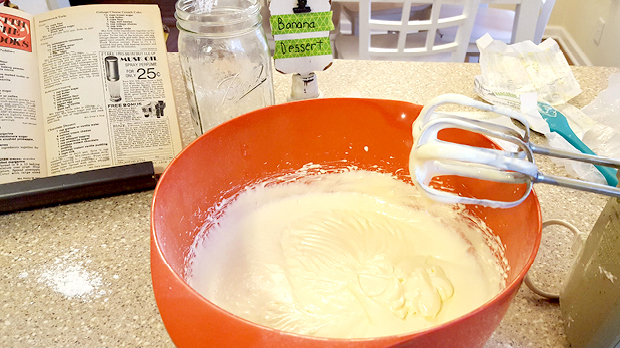 Honestly, don’t skimp on the time you whip this, it really changes the texture and changes this from an egg mixture to a mousse. Mouse layer after being whipped into submission. Spread the mousse over the graham cracker crust. Mousse layer all spread and pretty! Grab your bananas and a butter knife. 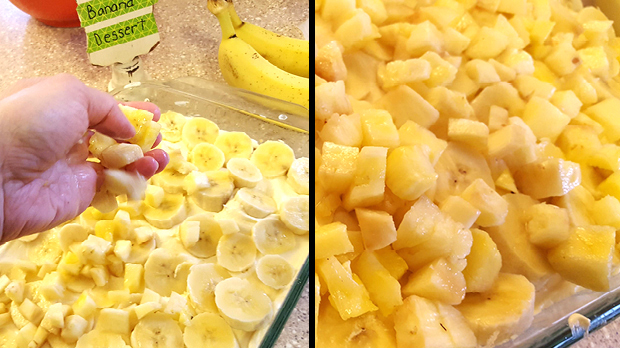 Cut the bananas into even slices (I aimed for 1/4 inch thick) and put them over the mousse. I only used 3 bananas, but depending on the size of your bananas you might need the 4-5. Sliced banana layer. Kinda boring, but what else is can I say? Spread the pineapple over the bananas. Spreading the pineapple over the banana layer…we’re almmost done! 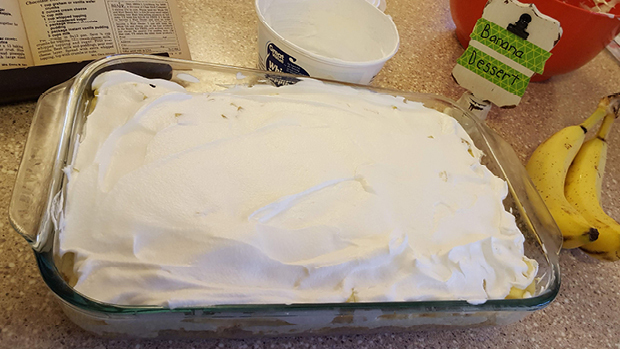 Now for the final step, spread the whipped topping over the fruit layer. It’s done! It’s done! It didn’t take that long, but now is the best and worst part…worst=clean-up, best=eating it! Final verdict: Thumbs up all around. Both girls really loved it—O was skeptical but once she licked my finger for a taste, she was completely on board. This would be a great Super Bowl party dessert. And I think you could change up the fruit with whatever you have on hand—canned peaches and pineapple would be good…strawberries and blueberries…fruit cocktail and bananas. The possibilities are endless. 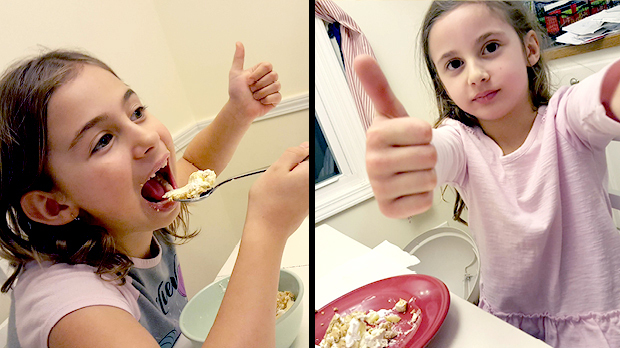 Thumbs up give to all for the Banana (Pineapple) Dessert. Banana Dessert is a recipe from The Workbasket, January 1978. 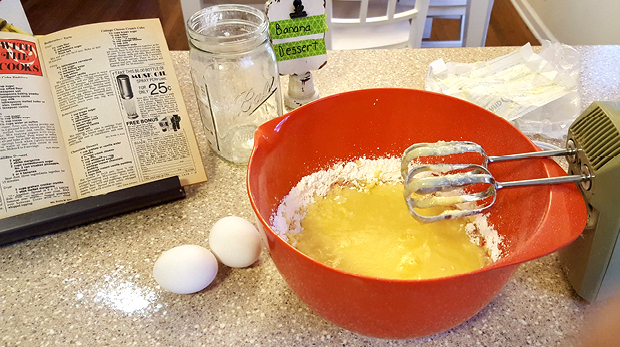 This was a submitted recipe by Mrs. Emma M. Kern. 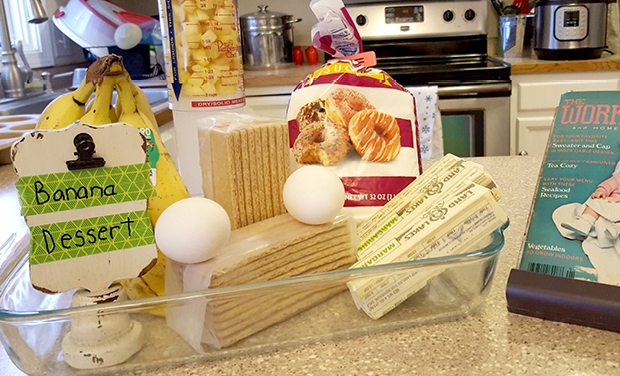 Mix together the crust and spread onto the bottom of a 9x13 baking dish. Put in the refrigerator to set up while mixing the mousse. Beat together the mousse ingredients together for 15 minutes. 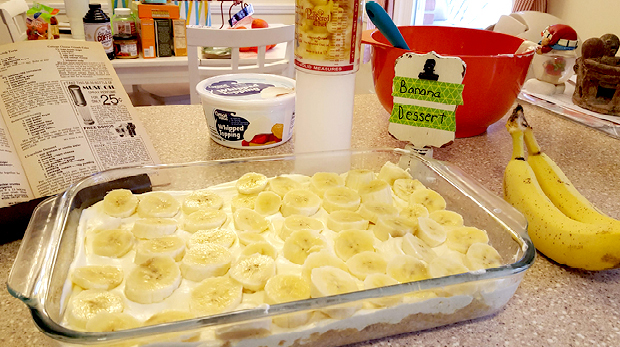 Next, add the topping by first slicing the bananas and adding one layer over the mousse. Next spread the pineapple over sliced bananas.